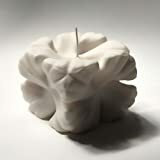 Form and function melt together with these cool new Architectural Candles from sculptor Andrej Urem. These unique sculptural candles are first modeled within a computer by the sculptor and then rendered by hand with clean-burning soy wax. If you ever decide to light them up, their shapes will be preserved as the wicks burns down through a well in the middle allowing them to glow from within. Available in two versions and make cool gifts.